Paintings are able to convey moods better than photographs. That's a well known fact from times of old until the present age today. By making use of the various shades of color, hue, contrast, and composition, artists have been able to make representations of drama, serenity and other moods that photographers could not. Marine seascapes are especially suitable when rendered in paintings. Only the most intrepid and daring photographer will dare venture into the middle of strong winds, hurricanes, typhoons and giant waves, in wet and slippery conditions, under poor lighting conditions to snap that one award-winning photograph. Marine artists are able to do that in the comfort of their studios, often by studying many photographs and putting the whole scene together. Seascape paintings are extremely suitable for offices, bars, shopping complexes, hotels and other public and private collections because the sea has a certain ever-changing mystery aura about them. Shipping, oil companies and other companies that tap the resources of the sea will find calendars featuring seascapes very attractive for their clients. We do seascape paintings on requests. Contact us for your requests. Happy Collecting! 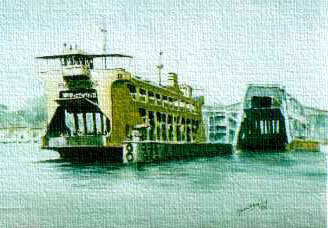 W21" x H15" Watercolor US$49 Passenger and vehicle ferry of Penang, Malaysia. The ferry is driven by 2 vertical shafted propellers called Voith Schneider propellers. It is able to move forward, backwards, and sideways without the use of rudders. Penang Ferry heading towards its destination. The ferry plies between Penang Island and the mainland, Butterworth, in Malaysia. Fishing boats waiting to go out to the open sea.